1850 Company founded by John Summers. 1869 Summers decided to produce his own wrought iron, and built a new factory at Bayley Fields, Stalybridge. This was the Globe Iron Works and had 12 puddling furnaces and rolling mills, and had a rail connection with its own locomotive. 1876 Summers died; his sons continued the business he had established. 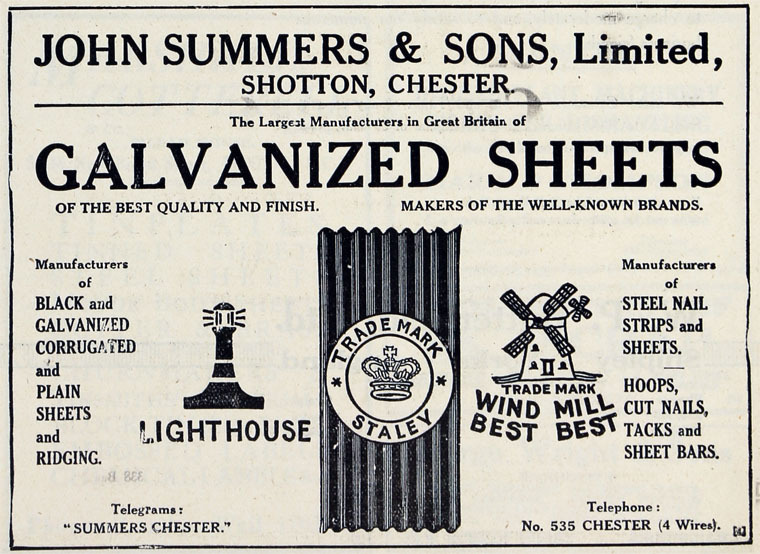 1895 His sons set up Shotton Steelworks, eventually becoming the Shotton Iron and Steel Ltd subsidiary. 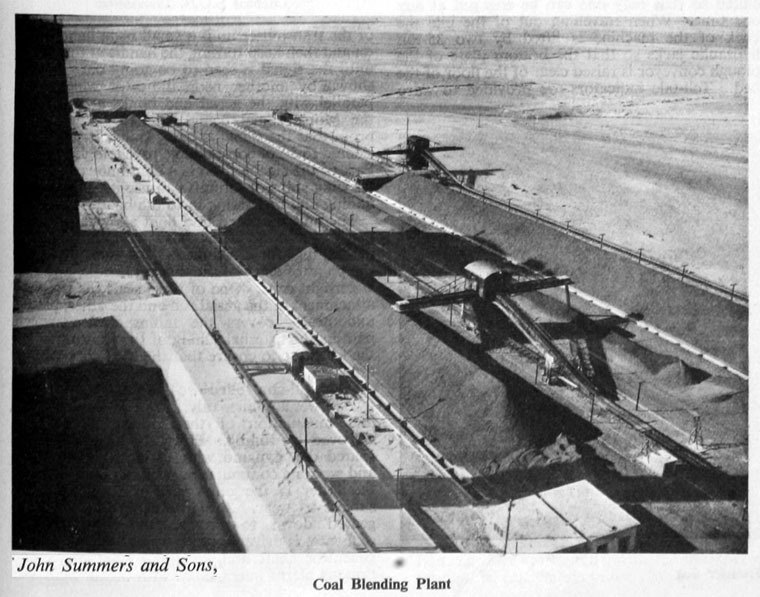 1939 Continuous rolling mills erected at Shotton. 1954 Public offer for sale of shares in the company by the Holding and Realization Agency; a small part of the shares were allocated to United Steel Companies, which had a substantial stake in the company before nationalization . 1956 Took over Burnell and Co Ltd and Birmingham Corrugated Iron Co Ltd at the request of the Holding and Realization Agency . 1963 Closed Burnell and Co Ltd and Birmingham Corrugated Iron Co because their hand mills could not compete with modern processes . 1967 One of the 14 largest steel companies, representing about 90 per cent of the UK's steel making capacity, brought into public ownership as part of the British Steel Corporation . A history of the Summers family and of the company was published in 'The Summers of Shotton' in 1987 . The following information is drawn from the book. We learn that the founder, John Summers, was born in Bolton on 17 May 1822. His father, John, was a weaver. John Summers Jr. left Bolton in 1842 to become a clogmaker in Dukinfield. He married Mary Woolley in 1848. He bought his clog irons from a man in the next street, Giles Potter. Summers bought him out and began to make clog irons and nails on his own account, and he prospered. In 1851 he visited the Great Exhibition and bought a nail making machine which he saw there. Needing larger premises, he leased the Sandy Bank Iron Forge and its row of three houses. The premises were given the snappy title 'Sandy Vale Cut & Patent Wrought Nail & Clog Iron Works'. 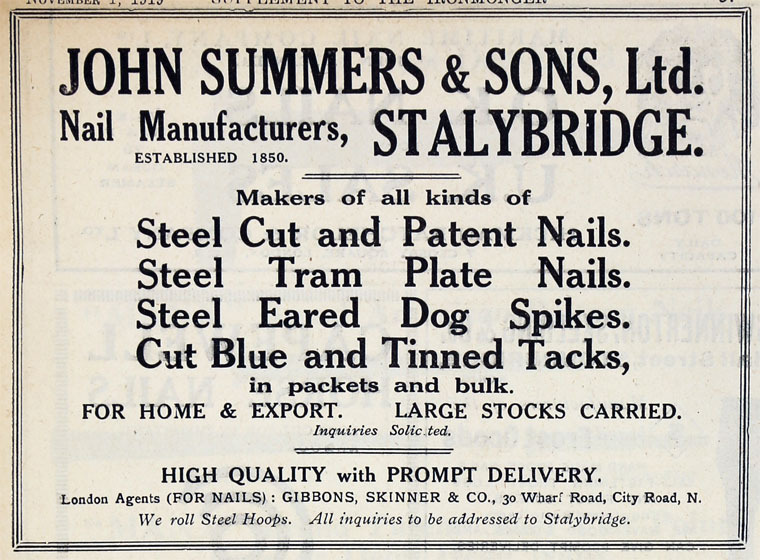 In 1869 Summers decided to produce his own wrought iron, and built a new factory at Bayley Fields, Stalybridge. This was the Globe Iron Works and had 12 puddling furnaces and rolling mills, and had a rail connection with its own locomotive. John Summers died from a brain haemorrhage on 10 April 1876, leaving seven sons and two daughters. His wife, Mary, had died on 2 October 1870, at 42, a month after giving birth. The main burden of the business was carried by the eldest and third sons, James and John, later to be joined by some of the younger brothers. By 1889 the partners in the business were all Summers - James, John, William, Walter, Harry and Frank. Demand for nails had greatly reduced, and it was decided to move into the production of rolled iron sheet and bars. 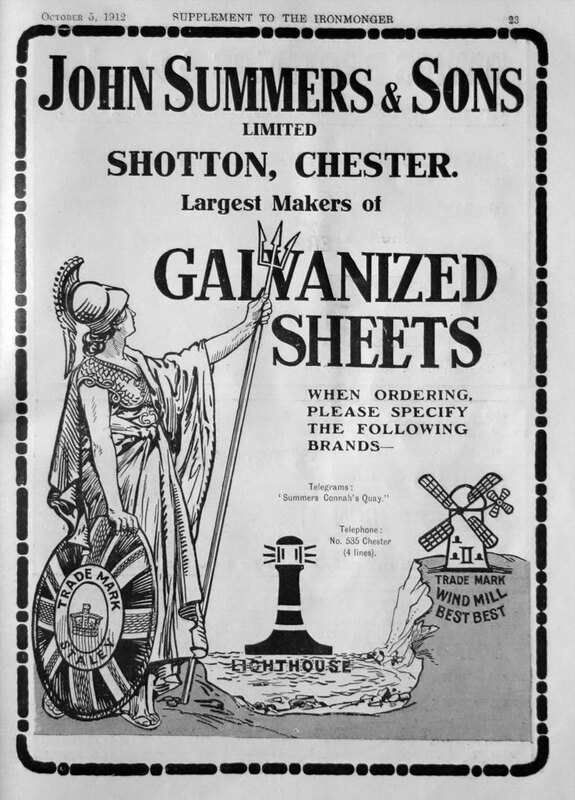 Much of their production of sheets was sold for galvanising, so the firm decided to install their own galvanising plant, which started in 1894. By then, they occupied all the available land, 24 acres, and decided to expand on a 'greenfield site', eventually selecting Sealand Marshes on the Dee estuary, where the Hawarden Bridge (Shotton) Works was established, opening in 1896. James and Frank Summers were in charge, John and Harry remaining at Stalybridge. 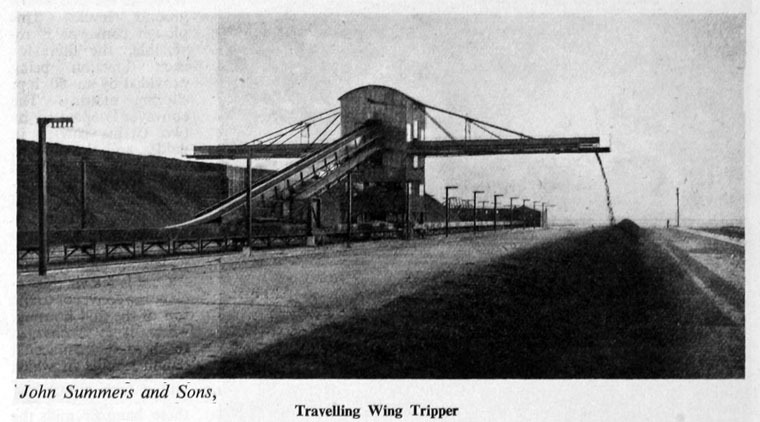 However, Harry visited Shotton regularly, and became dissatisfied, considering that James and Frank and the senior managers were not devoting sufficient time to the business. By 1908 Shotton had outgrown the Stalybridge works, and the headquarters was moved there. Harry was put in charge, and removed the under-performing managers. He became chairman in 1913, following the death of James. 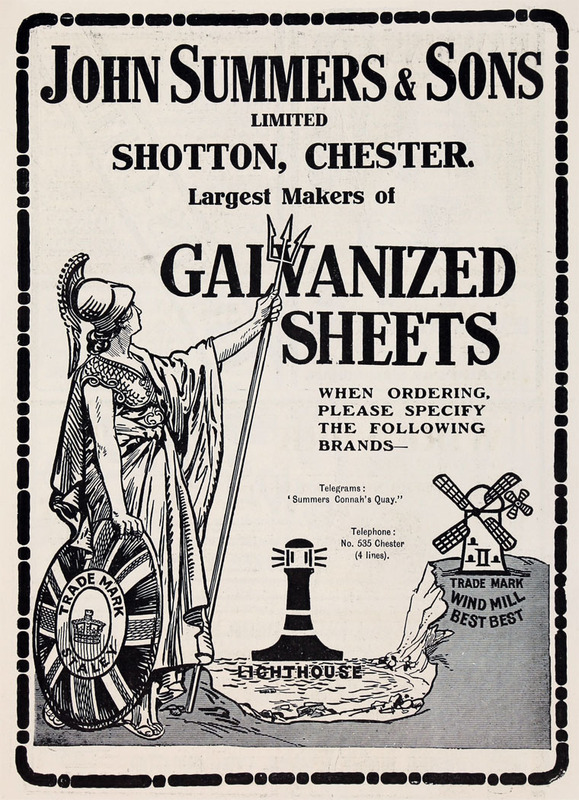 Steel had initially been imported to Shotton from the USA, to be rolled into sheet. 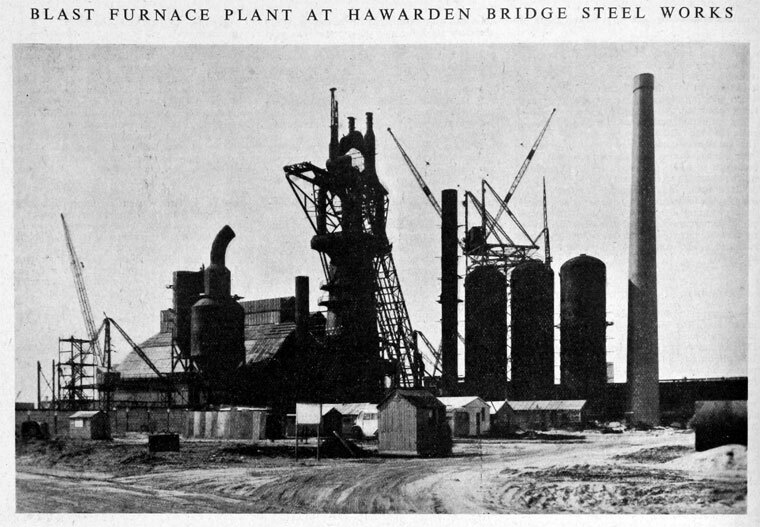 However, in 1902 they began to make their own steel at Shotton, starting with nine 50-ton open hearth furnaces in No. 1 Steelworks nine 50 ton furnaces. However, it was not until 1917 that all the steel was produced in-house, with the opening of No.2 Steelworks and bar mill. 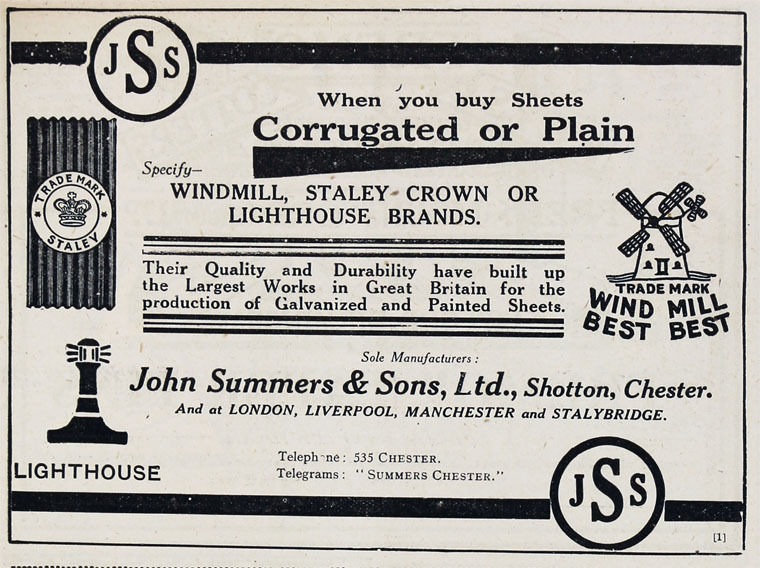 In 1917 Summers acquired the Wolverhampton Corrugated Iron Co at nearby Ellesmere Port. In 1920 they bought the Shelton Iron and Steel Co and its collieries. The rolling mills at Globe Iron Works were closed down in 1929. The Great Deprssion also brought massive job losses at Shotton. Major investment was undertaken in the mid 1930s, with the introduction of the first Sendzimir mill in Britain. 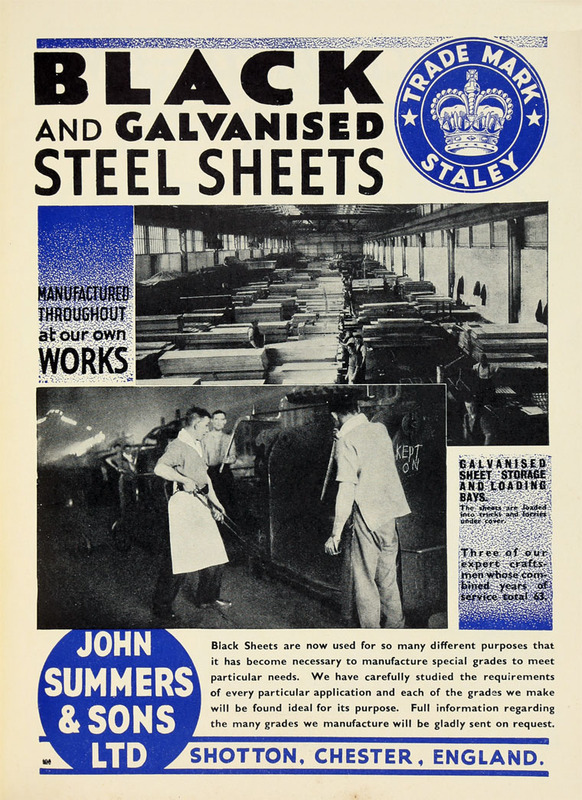 Britain's first continuous hot-dipped galvanising line opened in 1937. Also in 1937, it was decided to install a continuous strip mill, and Summers consulted Lorenz Iversen, President of the Mesta Machine Co of Pittsburgh. Additional capital was obtained by taking in the United Steel Company and the Bank of England as partners. Over 7000 tons of machinery was imported from the USA in 1939. The first slab was rolled on 9 November 1939. During WW2 Summers produced 3,350,000 tons of steel ingots and rolled 2,220,000 tons of sheets. In 1947 a ten year expansion plan commenced, with a budget of £54 million. The industry was nationalised in 1951, only to be denationalised in 1954, but expansion continued. Renationalisation came in 1967, at which time Summers employed 13,000 people, and their works covered 980 acres. The Globe Iron Works closed in 1969. Iron and steelmaking ended at Shotton in 1980, although rolling and finishing continued. The 1892/1894 O.S. map  clearly shows the works, located where the Huddersfield Canal crossed the River Tame. It was south of Bayley Street, and 400 yards SW of Stalybridge Joint Station. The works had its own railway system connected to L&NWR and MS&LR system. It was also served by a coal drop which branched off the railway lines. Close to the canal, the map shows a horseshoe-shaped building, probably where iron puddling was carried out. The 'Godfrey Edition' reproduction of the 1892/1894 O.S. map, includes a great deal of background information, including the fact that Henry Summers of the Globe Iron Works lived at Kelsall House. The map shows that this was separated from the ironworks only by the railway. A 100 yard long footbridge ran from the bottom of Summers' garden to Bayley Street, close to the ironworks' entrance. We also learn from the map's notes that Henry Summers' brother James lived nearby in a large house called Thompson's Cross. It is clear from the map that Kelsall House, Thompson's Cross and their neighbouring properties were substantial houses in landscaped gardens, and that this area, north of the complex of railway lines, was completely different in character from the area south of the tracks, characterised by a remarkable number of cotton mills. 'BURST FLYWHEEL. TON OF METAL HURLED QUARTER OF A MILE. ONE MAN KILLED. Terrible havoc was wrought at Stalybridge. Cheshire, Friday afternoon, by, the bursting a big flywheel at the large ironworks of Messrs John Summers and Sons (Limited). One workman was killed and ten other employees were injured, one dangerously. The dead man is John Hopwood, Leech-street, Stalybridge. 'The flywheel was 40 feet in diameter and several tons in weight. Just after two o'clock yesterday afternoon the wheel burst with a report so terrific that it was heard a mile away. 'HURLED QUARTER OF MILE. One fragment of metal, weighing about ton, was hurled through the air across the River Tame into the galvanising packing department of the firm, a quarter of a mile away. The great piece of metal crashed through the roof, reduced wagon loaded with coke almost to matchwood, and killed Hopwood, and injured several workmen who were engaged in unloading the wagon. Other fragments were hurled in various directions, and many people had marvellously narrow escapes from injury. One fragment the wheel, about four feet long, crashed through the roof of No. 5 rolling mill, and although workers were engaged there all escaped injury. 'PROVIDENTIAL ESCAPE. One man who had heard the report the explosion was dashing to the door when a great fragment of metal hit the earth at the very spot where he had been standing. A spoke of the flywheel, a solid piece iron about five feet long, smashed through the roof of a shed about forty yards from the engine house, and again nobody was hurt. Around the engine house was a scene of indescribable confusion. Girders had been twisted and broken. A hole many feet in diameter was caused in the mill chimney by a piece of the flywheel, and the chimney cracked from top to bottom. A portion of the top fell, and the stack is now an unsafe condition. Only the axle and a few spokes of the flywheel remain. This page was last edited on 27 March 2018, at 12:47.